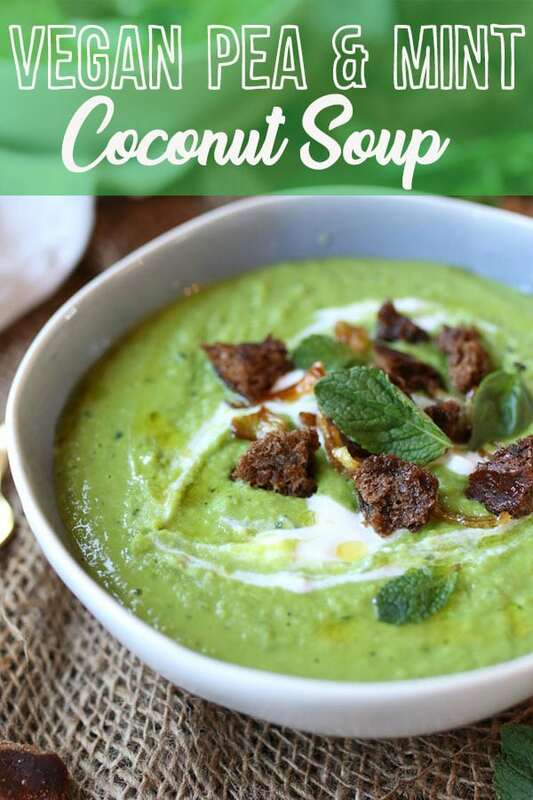 This Vegan Pea, Mint and Coconut Soup is a delicious Gluten Free Healthy Soup Recipe that is a great St. Patrick’s Day recipe! I don’t talk a lot about my hubby because while he’s a HUGE supporter of Abbey’s Kitchen behind the scenes, he like to do his own thing. What I can say about him, however, is that he absolutely loves peas. I hope our baby has such a strong affinity for those little green spheres because he honestly can’t get enough of them. He would be happy with a bowl of frozen peas straight out of the freezer for dinner if that was what I served him at night. So to celebrate the hubs, and start to introduce our little Button to some green flavours in utero, I decided to make this Vegan Pea, Mint and Coconut Soup. I also thought this would be a really fun and healthy way to celebrate St. Patrick’s Day that doesn’t involve a hangover from green beer! So this starts with frozen peas. Honestly, I love frozen peas because they’re convenient AF (literally they thaw out in minutes), incredibly affordable and available all year round. 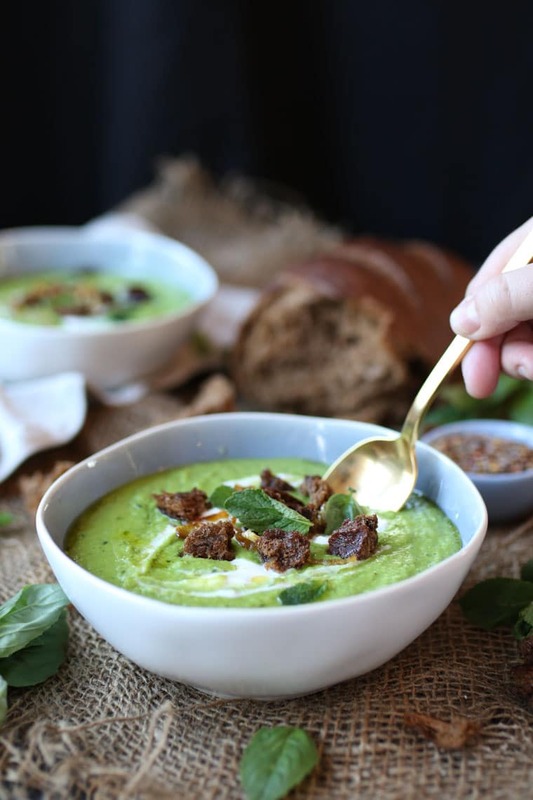 Even in the heart of fresh pea season, you wouldn’t catch me in a MILLION YEARS trying to shuck 1 Kg of fresh peas to make this Vegan Pea, Mint and Coconut Soup. WHY WHY WHY would anyone in their right mind do that? So we start with a simple saute of a few veggies and garlic, our peas, stock, and bouillon. It’s really a simple soup. I like to round out that vegetal green pea flavour in this Vegan Pea, Mint and Coconut Soup with some creamy coconut milk. It’s a surprising combination that is REALLY delish. 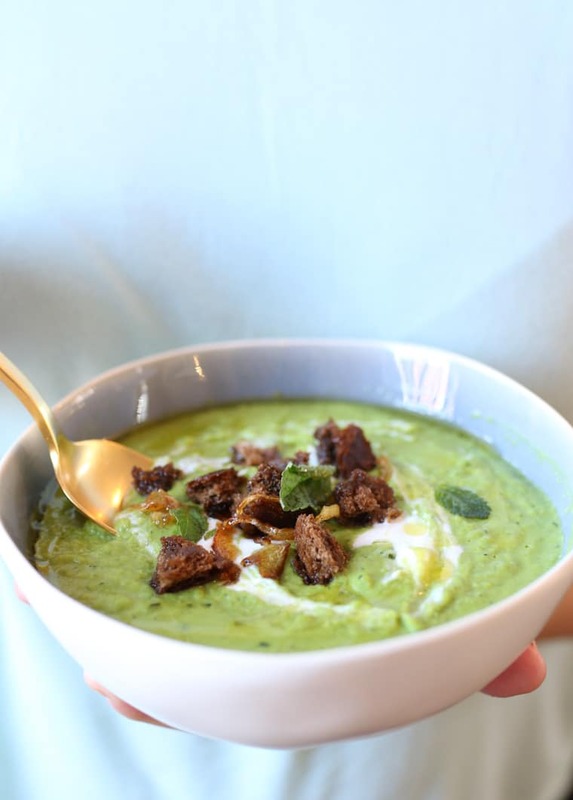 You can enjoy this Vegan Pea, Mint and Coconut Soup casually as leftovers throughout the week, or you can dress it up to be all fancy pants for a St. Patrick’s Day party by adding some sweet caramelized onions and some crispy gluten free croutons on top. Honestly, crunchy croutons and caramelized ANYTHING makes the whole world seem better and makes eating your green things WAY more fun. And no hangover, so yay!!! I would love to know what your going to be serving that’s green on St. Patrick’s Day? 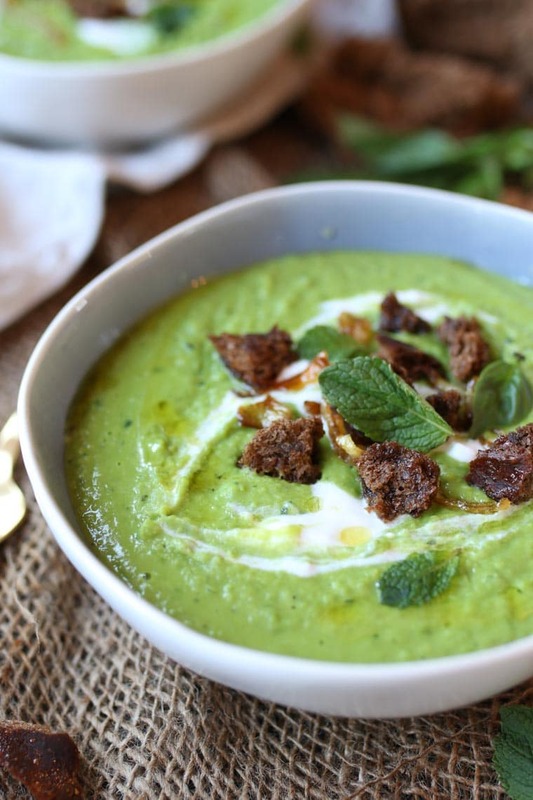 Have you tried this Vegan Pea, Mint and Coconut Soup? Leave me a comment below with your thoughts! 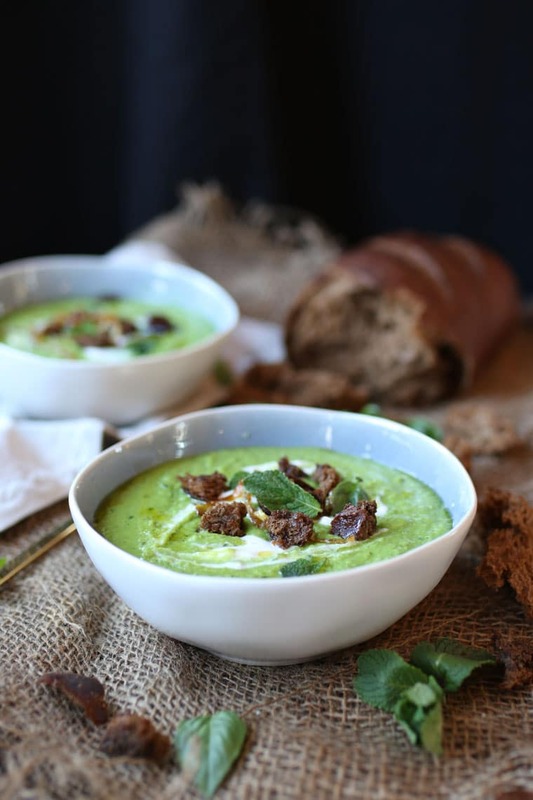 This Vegan Pea, Mint and Coconut Soup is a delicious Gluten Free Healthy Soup Recipe that is a great St. Patrick's Day recipe! In a large soup pot, heat the olive oil over medium heat. Add in the onion, celery and garlic and saute until soft, about 4 minutes. Add in the peas, water, and bouillon, cover and cook until the vegetables are soft, about 10-15 minutes. Puree using a hand blender until smooth, then add in the mint, basil and coconut milk. Puree again until smooth. Season with salt and pepper, to taste. Meanwhile, heat a small nonstick skillet over medium low heat with the two teaspoons of oil. Add the sliced onion and cook until caramelized, about 45 minutes. Set aside. To serve, garnish the soup with caramelized onions, croutons, basil, mint and olive oil. Enjoy! Previous Post Isagenix, Skinny Tea, and Weight Loss Supplements – Do They Work? Yup, as long as you provide a link to my website! Can you believe I’ve NEVER had pea soup before?! But I always wanted to try it. NOw I just must. 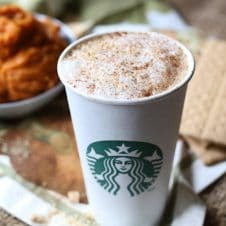 This looks so creamy and delicious. … and so easy to make. Yes! 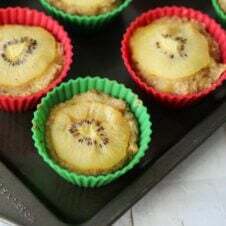 You must try this one! I’ve love to be eating this for St. Patrick’s Day or any day of the year. Great ingredients! The color of this soup is SO pretty! I’m sure it tastes as delicious as it looks! This is so bright and delicious looking (and perfect for St Patrick’s Day)! 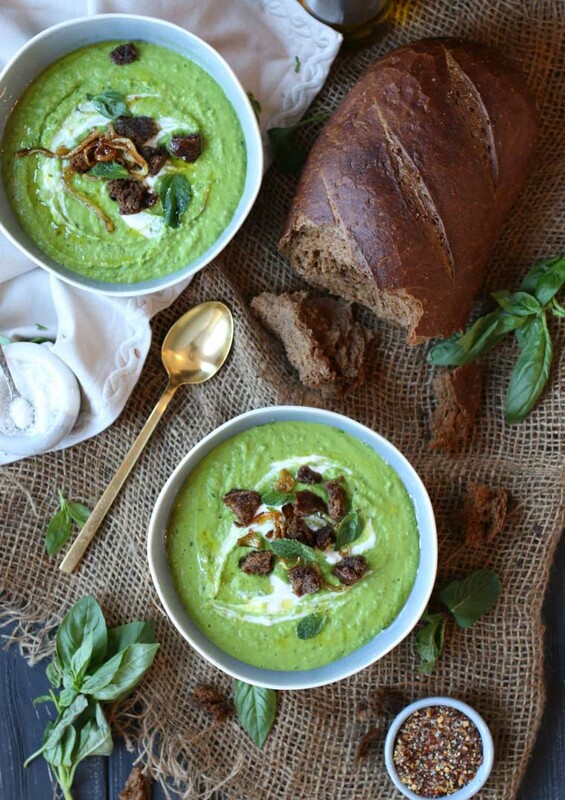 We are usually not big pea fans in our house, but I think I might change that with this soup. Yes! 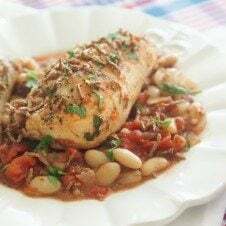 Give this soup a try and let me know! I admit — I would never have put these ingredients together. But after reading the recipe it sure does sound delicious!